Harvey Keitel (/kaɪˈtɛl/ ky-TEL; born May 13, 1939) is an American actor and producer. An Oscar and Golden Globe Award nominee, he has appeared in films such as Martin Scorsese's Mean Streets and Taxi Driver, Ridley Scott's The Duellists and Thelma & Louise, Peter Yates' Mother, Jugs & Speed, Quentin Tarantino's Reservoir Dogs and Pulp Fiction, Jane Campion's The Piano, Abel Ferrara's Bad Lieutenant, Robert Rodriguez's From Dusk till Dawn, James Mangold's Cop Land, Paolo Sorrentino's Youth. Along with actors Al Pacino and Ellen Burstyn, he is the current co-president of the Actors Studio. Keitel was born in the New York City borough of Brooklyn, the son of Miriam (née Klein) and Harry Keitel, Jewish immigrants from Romania and Poland, respectively. His parents owned and ran a luncheonette and his father also worked as a hat maker. Keitel drifted into obscurity through most of the 1980s. He continued to do work on both stage and screen, but usually in the stereotypical role of a thug. Keitel played a corrupt police officer in the 1983 thriller Copkiller (co-starring British rock musician John Lydon), before taking supporting roles in the romantic drama Falling in Love (1984), starring Robert De Niro and Meryl Streep, and Brian De Palma's mobster comedy Wise Guys (1986), starring Danny DeVito and Joe Piscopo. Keitel starred in Quentin Tarantino's Reservoir Dogs (which he co-produced) in 1992, where his performance as "Mr. White" took his career to a different level. Since then, Keitel has chosen his roles with care, seeking to change his image and show a broader acting range. One of those roles was the title character in Bad Lieutenant, about a self-loathing, drug-addicted police lieutenant trying to redeem himself. He co-starred in the movie The Piano in 1993, and played an efficient clean-up expert, Winston "The Wolf" Wolfe in Quentin Tarantino's Pulp Fiction. Keitel starred as a police detective in Spike Lee's Clockers (an adaptation of Richard Price's novel, co-produced by Martin Scorsese). In 1996, Keitel had a major role in Quentin Tarantino and Robert Rodriguez's film From Dusk till Dawn, and in 1997, he starred in the crime drama Cop Land, which also starred Sylvester Stallone, Ray Liotta and Robert De Niro. His later roles include the fatherly Satan in Little Nicky, a wise Navy man in U-571, diligent FBI Special agent Sadusky in National Treasure and the latter's sequel National Treasure: Book of Secrets. In 1999, Keitel was replaced by Sydney Pollack on the set of Stanley Kubrick's Eyes Wide Shut, due to shooting conflicts, and appeared in Tony Bui's award-winning directorial debut, (Three Seasons (which Keitel also executive produced). Keitel also re-teamed with Jane Campion for Holy Smoke! (co-starring Kate Winslet). Who's That Knocking at My Door J.R.
Two Evil Eyes Roderick Usher Segment: "The Black Cat"
Rio, I Love You Himself (as O Ator) Segment: "O Milagre"
The Ridiculous 6 Smiley Harris Owner of "The Golden Nugget"
Hogan's Heroes German Soldier Episode: "The Great Impersonation"
N.Y.P.D. Ramby Episode: "Case of the Shady Lady"
Great Performances Jerry Episode: "A Memory of Two Mondays"
Kojak Jerry Talaba Episode: "Siege of Terror"
The F.B.I. Ernie Episode: "Deadly Ambition"
Happy Days Happy Days Episode: "Knock Around the Block"
Amazing Stories Byron Sullivan Episode: "Vanessa in the Garden"
The Ellen Burstyn Show Frank Tanner Episode: "Reading Between the Lines"
The Play on One Carl Episode: "Down Where The Buffalo Go"
Saturday Night Live Siegfried Episode: "Robert De Niro/Norah Jones"
Inside Amy Schumer Proposition Man Episode: "Fame"
↑ Lipton, James (October 18, 2007). Inside Inside. Dutton. p. 14. ISBN 9780525950356. ↑ Schoemer, Karen (November 7, 1993). "Harvey Keitel Tries A Little Tenderness". The New York Times. Retrieved March 7, 2013. 1 2 3 4 5 6 7 8 9 10 11 12 13 Inside the Actors Studio. The Actors Studio, Bravo Network, Betelgeuse Productions. 1998. Retrieved December 27, 2014. ↑ Cowie, Peter (1994). Coppola: A Biography. New York: Scribner. p. 122. ISBN 978-0-306-80598-1. ↑ "24th Moscow International Film Festival (2002)". MIFF. Retrieved March 30, 2013. ↑ Mitovich, Matt (July 24, 2008). "Scoop! Keitel Lands on Mars as Homicide Boss". TV Guide. Retrieved March 7, 2013. ↑ Dolan, Jon (December 13, 2013). "'Beyonce' Breakdown: The Ultimate Guide to Bey's Surprise New Album". Rolling Stone. Retrieved December 14, 2013. 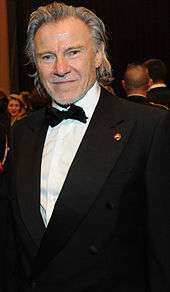 ↑ "Monterey Media Acquires Three Films, Including Works Starring Gerard Depardieu and Harvey Keitel". indiewire.com. October 17, 2013. Retrieved November 6, 2013. ↑ "Direct Line challenges rivals with Harvey Keitel 'fixer' ads". marketingmagazine.co.uk. August 29, 2014. Retrieved September 4, 2014. ↑ "Meet Winston Wolfe". directline.com. August 30, 2014. Retrieved September 4, 2014. ↑ Mottern, James (November 29, 2012). "Slate for 'God Only Knows'". jamesmottern.com. Retrieved March 7, 2013. 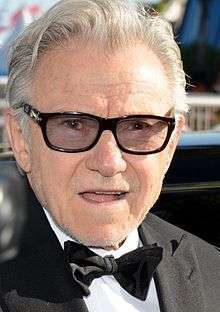 Wikimedia Commons has media related to Harvey Keitel.